If you’re up to speed with what VMware has done in the world of primary storage over the past few years, then you’ve heard of Virtual SAN, Virtual Volumes, and Storage Policy-Based Management (SPBM). All these technologies work together to make your primary storage infinitely better. VVOLs and SPBM allow you to automate storage provisioning and management, even on traditional SAN and NAS arrays. In the world of hyperconverged infrastructure, VSAN now counts more than 5,000 customers and has become the clear leader in the HCI market. VSAN is the future for primary storage – and is on an incredible growth trajectory, growing at 3X year over year. 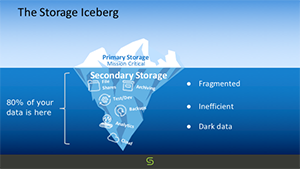 That’s all great news for primary data, but what about secondary storage? Secondary storage consists of all your copies of data that are not used by production applications: backups, test/dev copies, analytics data, and files. It just so happens that secondary storage can consume up to 80% of storage capacity. That’s a lot of capacity and money going to manage non-production data. And typically we’re storing many copies of the same data – backup copies, test/dev copies, analytics copies, etc. That’s a lot of inefficiency right there. Can’t we do better than to create 5-10 copies of the same data simply to support different use cases? 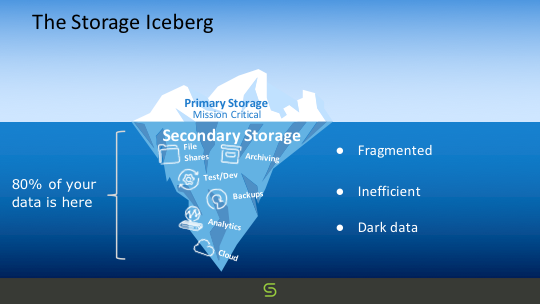 Even worse, secondary storage is incredibly inefficient from a management standpoint. For example, data protection in vSphere environments is still mostly a manual process. Backup admins will set fixed backup jobs with fixed service levels (typically a weekly full backup with a daily incremental), and applications just have to live within that service level. Then the backup data is sent to a dedupe appliance where it sits mostly unproductive until a recovery event happens. Cohesity provides a Google-inspired web-scale platform designed from the ground up to manage all your secondary data. At its foundation, Cohesity provides a scale-out storage platform with global dedupe, unlimited snapshots, and integration with all the leading public cloud vendors (AWS, Google, Microsoft Azure) to consolidate backups, test/dev copies, analytics data, files, and objects. Cohesity extends the storage platform with data management workflows for data protection, public cloud integration, test/dev, and analytics. 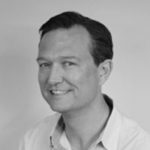 In short – the objective of Cohesity is to eliminate your secondary storage silos and replace them with a simple, efficient, purpose-built platform for the cloud era. At Cohesity, we love meeting with customers to explain this vision because it solves a real, concrete problem in the datacenter today. But it’s also a very broad solution and we often get asked “what’s the best way to get started in the short term”. The easiest way to use Cohesity is as a better backup target for existing backup software. Think of it as distributed dedupe storage running on commodity servers. Cohesity eliminates the pain points associated with managing individual dedupe appliances (forklift upgrades, capacity silos), provides public cloud integration, global dedupe, built-in QoS, multi-tenancy, higher ingest performance, at a fraction of the cost of traditional dedupe appliances. Cohesity DataProtect, our full data protection suite, is an end-to-end backup and recovery solution, converged on the platform. With DataProtect, customers can do away with the complexity of traditional backup software, media servers, master servers, and target storage. It’s all integrated as one converged solution. DataProtect doesn’t work like traditional backup software. Instead, we keep each backup copy as a fully hydrated snapshot on our platform. This allows us to provide sub-15 minute RPOs and instantaneous RTOs. DataProtect is entirely automated using data protection policies, similar to the benefits that SPBM and VSAN deliver for management of primary storage. And finally, protected data becomes immediately productive as it is kept in the form of snapshots, and can be put to productive use for other use cases. We’ve spent a lot of time ensuring tight integration between Cohesity and VMware products. 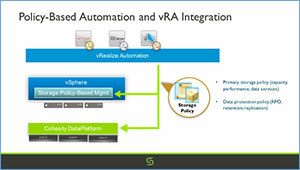 We integrate directly with the vSphere API for Data Protection to capture VM snapshots. Integration with vCenter provides a full inventory of vCenter objects in the Cohesity UI to set up data protection policies on a per-VM basis. For customers using VSAN today, you’re already enjoying the simplicity of hyperconverged, scale-out storage and policy-based management for your primary storage. You shouldn’t have to put up with the complexity of traditional backup in secondary storage. Cohesity provides the ideal secondary storage to sit underneath VSAN, enabling customers to benefit from the simplicity of a scale-out, hyperconverged platform for both primary and secondary storage. And at VMworld, we’ll be showcasing our latest integration with vRealize Automation. Cohesity is designed with an API-first architecture. These APIs can be used to integrate with existing automation and orchestration tools such as vRealize Automation. We have built a vRealize Orchestrator plugin which is used to expose data protection policies in vRA. Application owners using vRA to self-provision VMs can now select both primary storage policies (supported through VMware SPBM) and data protection policies (supported through the vRO plugin and the Cohesity policies). It all looks very integrated and seamless to application owners in vRA. And helps close a critical gap towards achieving full policy-based automation in the Software-Defined Datacenter. How to learn more at VMworld?